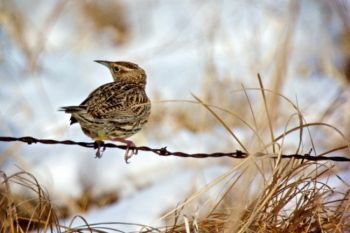 A meadowlark by the side of a Moody County road on April 13, 2013. Click to enlarge photos. He was dining on a bit of spilled grain. Another Moody County meadowlark found a better perch. 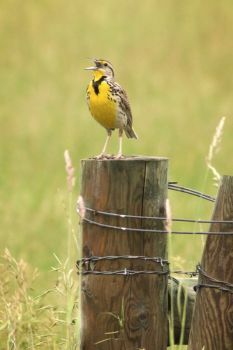 This meadowlark favored the scenery at the Badlands South Unit near Sheep Mountain Table. At Sage Creek Wilderness in the Badlands back in July of 2010. 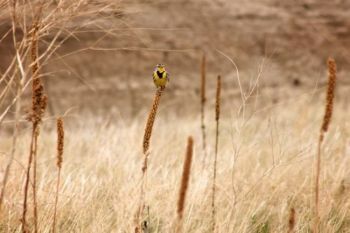 This meadowlark was spotted in Custer State Park. 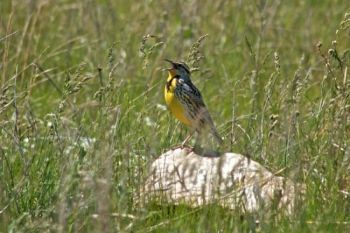 A Wind Cave National Park meadowlark in full song. 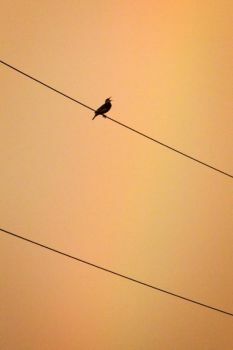 Singing after a summer storm in McCook County. Near the northwest corner of Sioux Falls. He's king of the fence post — and not afraid to let you know it. Singing in Custer State Park. Fort Pierre National Grasslands at first light. South Dakota weather is a funny, fickle thing. Last year, we had almost a full month of spring by mid-April. It is obvious that Old Man Winter wants to stick around a bit longer this time around. The persistent icy and snowy weather has me antsy for spring to really get here. I think the wildlife is ready too. All last week, I’ve noticed robins and meadowlarks all fluffed up in the cold and snow, just waiting for spring to actually be sprung. Three of my favorite things about spring are the smell of lilac on the breeze, the sight of pasqueflowers dancing on a hillside and the sound of a meadowlark’s song in the morning light. 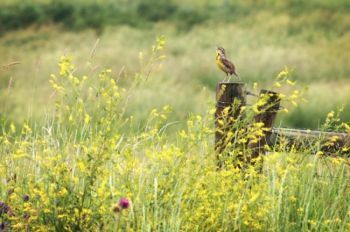 With that in mind, I gathered up some photos of meadowlarks I’ve captured the last few years while wandering all across our great state. 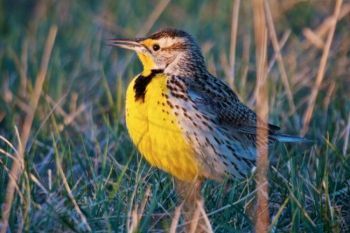 Meadowlarks are said to be sons of the south wind in some Native American legends. It makes sense — they arrive from the south, bringing the warmer weather that chases away winter’s chill. 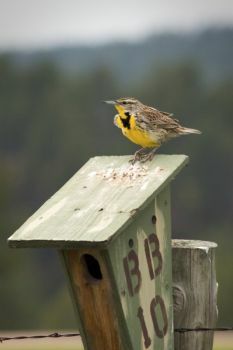 Lakota tradition also says that meadowlarks actually sang in the Lakota tongue. 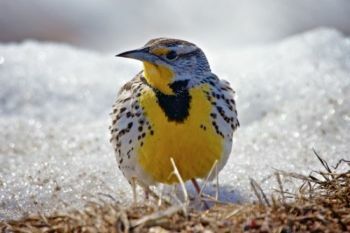 I remember as a kid being outside working on the lawn or the garden for mom and hearing a rather boisterous meadowlark singing his tune over and over. I soon found myself adding words to his notes. They were silly kid’s words, but it shows how the birds can be persuasive enough with their melodies to make a good impression on humans. My uncle spent a good deal of time helping our neighbor herd sheep along the Moreau River breaks when he was a young man. He was a good whistler and taught himself to mimic the birds he heard while killing time on the prairie. I remember when I first heard him whistle like a meadowlark. I was amazed at how good he was at it and every family gathering for the next few years, I tried to get him to do it again and again. 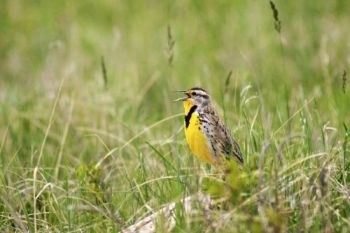 Meadowlarks have some serious pipes too. Last year when I was sitting in a prairie chicken blind somewhere in the Fort Pierre National Grasslands, a lone meadowlark decided to perch on the blind just after sunup. I was shocked at how loud his song was. I didn’t realize until I sat right under one just how much volume they produce. Now I understand why you can hear the song long before you see the bird on still spring mornings. Their famous songs make them a pretty popular bird. 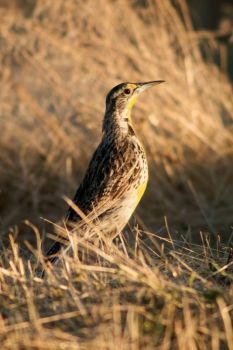 According to the Cornell Lab of Ornithology, the Western Meadowlark is the state bird of six states: Kansas, Montana, Nebraska, North Dakota, Oregon, and Wyoming. Only the Northern Cardinal is a more popular civic symbol, edging out the meadowlark by one state. Well here’s to the sons of the south wind to start singing in spring for real. I’m ready. The calendar as well as my old bones says its time for the grass to turn green, the trees to bud and the wildflowers to bloom. All, of course, accompanied by the meadowlark’s sweet song. Bring on spring! Please add a sound clip of some singing meadowlarks. Stories like this help to sustain my homesickness for the High Plains. Sound would make the article that much better. We don't have any meadowlark sound clips on file, but YouTube is always obliging. 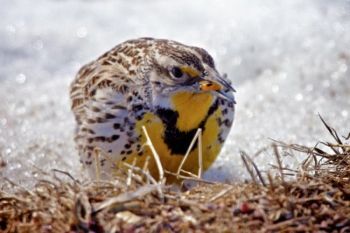 We saw a meadowlark at our feeder this weekend here in Yankton. A welcome sight, indeed!